Robert M.Utley, Geronimo. Yale University Press, November, 2012. 376 pages, $30.00. This review appeared in The Oregonian, January 20, 2013. You may remember Utley as a talking head on documentaries about the West, with his high-pitched voice, smooth round face and string-tie. He’s affable, avuncular, and good at story-telling—as you would expect from the former chief historian of the National Park Service. Unquestionably authoritative, given the range of subjects he’s written about, from Billy the Kid to Sitting Bull to Custer, Utley nonetheless makes an odd narrative choice in Geronimo. This Rashomon strategy puts a lot of demands on the reader, especially given that the bulk of the book covers Geronimo and his fellow Apaches’ twenty-odd year running battle with the US Army. It can be hard to keep track of the characters in this shifting series of encounters. This partly reflects his overall view that the portrayal of Geronimo “as the valiant Apache fighting for his homeland” is “plainly false.” Because he regards Geronimo as a cantankerous, duplicitous, manipulative, drunken, ruthless “raider” with no tribal loyalties, no veracity, and little honor, he contends that Geronimo was motivated primarily by personal ambition and operated somehow independently of his Apache identity. While he provides very little sense of Apache history before the brief era of the Indian wars, Utley does convey well the complexity of the alliances, shifting loyalties, and confused aims of all the combatants during the years that Geronimo lived on reservations or, on occasion, bolted for Mexico. The Sierra Madres of Sonora and Chhuahua provided a relatively secure base for Geronimo’s raids against both US territories and the ranches and villages of the Mexicans, who, as Utley repeatedly notes, Geronimo reviled. 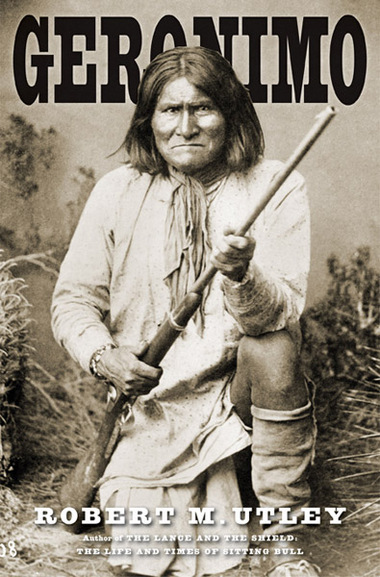 And with good reason—when Geronimo, then a young man in the band of the great Apache chief, Mangas Coloradas, was off with other warriors on “a peace mission” in Chihuahua, the Mexican Army attacked their encampment, and either killed all of Geronimo’s family or carried them off into slavery. In one of the great ironies of American military history, when he had at long last surrendered to American troops who had pursued him into Mexico, Geronimo and his tiny band of followers were heading back to the US when a Mexican force confronted them. Before they persuaded the Mexicans to stand aside, the US soldiers and Geronimo had “united and prepared to battle.” The US Army had long depended on its own Apache scouts to track “renegades,” but now they were prepared to fight alongside their prisoners of war. Perhaps the saddest element of Utley’s tale is the betrayal of the scouts, who were also treated as prisoners of war, despite their loyal service, and shipped off with “the hostiles” to Florida, then Alabama, and finally Oklahoma’s Ft. Sill, where Geronimo would spend his last days. Geronimo’s legend grew during his exile, an almost Zelig-like sojourn to world’s fairs in Omaha, Buffalo and St Louis (where my grandfather, as an eight-year old boy, saw him playing the role of a “wild Indian,” a fact which I find more astonishing as the years go by). He attended Teddy Roosevelt’s inauguration, riding in a parade alongside Quanah Parker, the Comanche chief who was also his neighbor in Oklahoma. According to S. C. Gwynne’s brilliant biography, “Empire of the Summer Moon,” Parker was in fact the person Geronimo was assumed to be as his legend grew. Even though his mother was a white woman captured as a child, Parker was the undisputed chief of his people, and a man admired for his personal strength of character. Gwynn shares Utley’s view of Geronimo, calling him both “a genius at self-advertising” and a drunk who “was not well-liked in Indian Country.” Parker in turn was described by the Commissioner of Indian Affairs as a man “stamped by nature” with “the seal of headship.” But while Gwynn’s account of Parker’s life illuminates the lost, little-known world of the Comanches, the “lords of the Plains,” Utley’s narrow focus leaves Geronimo and his people largely in the shadows.